Even though there are many instances where God interacts with humans in Genesis, we have covered most of those on our previous series of posts on Genesis. Therefore, I will skip ahead to the book of Exodus where we find another strong indication of God’s desire to be with us. When Israel left Egypt God was visibly with them. He delivered them from Egypt with a mighty hand and great wonders. The people of Israel can just look up and see the cloud, representing the presence of God with them. We tend to look back at this story and wonder. "How amazing it must have been to have experienced God working such wonders and miracles!" "How incredible it must have been to look up and see a cloud during the day reminding you of God’s presence and care." "How wonderful to have a pillar of fire at night. Scaring away predators, providing you with a night light, and not to mention a heater during the chilly desert nights." We wish we could have been there, because if we had that experience our faith would be greater. We believe if we had experienced what the Israelites experienced during the Exodus our faith would be significantly stronger. If only we could be aware of the presence of God as the children of Israel were during the Exodus, then everything would be different. Or so we tell ourselves. We want to believe that given the mighty signs and wonders the people of Israel witnessed recently, plus the cloud they could see, would be enough to strengthen their faith and drive away all worry and fear. But they cry out to God and complain to Moses. They claim they would rather have been left in Egypt serving the Egyptians. Do we ever behave like this? One day we are praising God for delivering us from a great trial, the next day we are complaining about how He has led our life, wishing He had just left us alone in our previous lifestyle? The truth is that learning to trust is not easy. Is it coincidence that God called Israel out of Egypt and then brought them through the wilderness? Israel complained but God was avoiding war, (Exodus 13:17-18) God was taking them the best way possible, and they were still complaining. Thinking about this I began to see a pattern. Jesus spent some time in the wilderness right after His baptism and before beginning to preach. (Matthew 4) When Satan came to tempt Jesus, Jesus told Satan what we all learn when we go through our wilderness experience. The wilderness experience is not comfortable, away from the comforts of home and the protection of a city. You have to depend on God in the wilderness. In Exodus we have God wanting to reveal to His children the kind of God that He is. He wants them to know that He will provide for them. But they complain, they don’t want to rely on God daily. Couldn’t God just provide for them in such a way that they would never have to wonder, just always giving them plenty and taking care of all their problems even before they had to ask for help? The people of Israel would learn about God as they spent time with God. Do we want to experience God with us or God at a distance? To be called just in case of emergency? The wilderness experience is always challenging, but it causes us to develop our relationship with God, it teaches us to trust Him and it allows us to face and overcome greater challenges in the future, challenges we would never dare face if it had not been for the lessons we learned during our wilderness experiences. Moses learned to be patient in the wilderness. Jacob learned to be honest and to refuse to let go of God. Elijah was able to pray and fire came down from heaven. Israel was facing their first wilderness experience. and what does Moses say? Moses had already had his wilderness experience. Moses was not afraid, he had already learned what God was like, not only what God was capable of but how much God cared about His children. We ought to know by now that God will fight for us. But we insist in worrying in the meanwhile. We know He will provide, but we stress until He does. It’s Christmas season, we are celebrating the birth of Jesus. Yet we wonder if God really cares? We wonder if He really loves us? We wonder if He is really powerful? I hope that you can take time to ponder God’s desire to be with us. Not only in a general and impersonal sense, but God’s desire to be with you. To be your Lord and Savior. 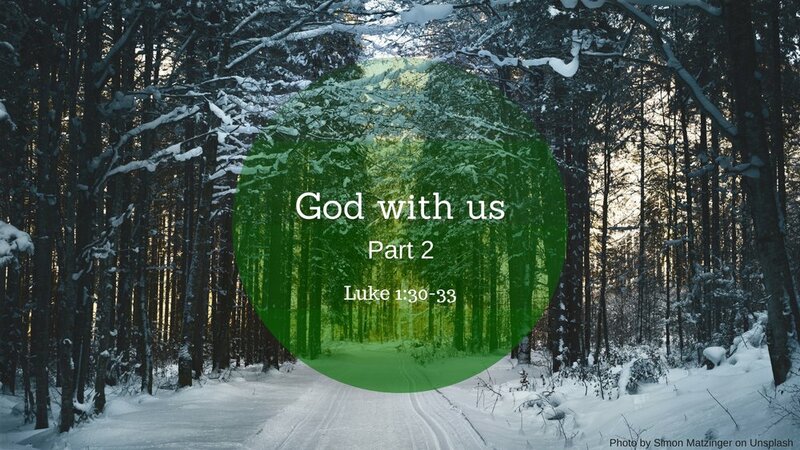 Throughout the Bible God has revealed His desire to be with us. Today, this coming week, will you make clear your desire to be with God? To develop an intimate relationship with Him to really invest into a relationship with Him as opposed to just going through the motions? God has done His part. It's clear that God wants to be with you. The only question left is do you want to be with Him?